Our founder was originally a fabric merchant in the Shinshu region of Japan, but he gained a reputation on the side as a maker of fine soba noodles. 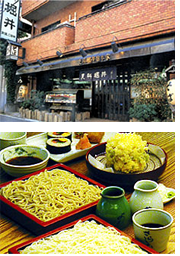 In1789, at the suggestion of his lord, he switched jobs and opened a soba noodle shop in the Asabu district of Edo (modern Tokyo). In 1875 the shop name was officially changed to Horii, and from the fifth generation to the present day we have continued to offer our traditional Horii “sarashina” soba noodles. Soba noodles, as you probably know, are made from buckwheat flour, but sarashina noodles use flour ground from only the innermost part of each buckwheat grain. This, together with our own unique process, produces noodles that are pure white in color, with a delicate aroma and a texture that is smooth as silk.